Miranda:: Your tale, sir, would cure deafness. The sonata op. 31 no. 2 is nicknamed the “Tempest sonata“, not a name by Beethoven himself but by Anton Schindler, or rather because of Anton Schindler. Schindler was Beethoven’s secretary and after the composer’s death, he told tons of stories, many of them not true. According to Schindler, when he asked Beethoven about this sonata, the answer was that if he read Shakespeare’s “The Tempest” he would understand the music. I’m not going to pretend that I have read “The Tempest” (although I found the above quote while glancing through the play) but still, I have a very hard time believing this story. But I like names on sonatas and “Tempest” sonata is a good one, not bad at all for this music. The Tempest sonata starts with something that would be more like a question. It is a great way to start a piece: it creates an atmosphere right away, it feels a little bit like a a curtain is slowly going up in a theater, silencing the audience who is eagerly anticipating what will happen. But it’s more than that. The way this chord is written, it makes us think of a recitative. OK. That was the most awful, boring recitative ever. But I like when he says that he can’t express that “amelodically”. A recitative is something “sing-spoken”, basically when the words are such that they resemble more of spoken sentences than sung verses. Recitatives are used in opera, oratorios and such, where there is a literal story to tell. Let’s say that the words are “My love, I was at the market today, and everybody is talking about the big storm coming”. Who wants to write a song with those lyrics? Nobody, so there shall be a recitative. Why not just say the words then, you might ask? Well, many composers thought the same thing. Mozart was not fond of long recitatives, he found them boring. Rossini cared so little for how the recitatives were done in his operas that he often let someone else write them. But Rossini was also known for being the laziest composer of all times. Kind of the Garfield of composers. If you think it’s quite silly, it is supposed to be. Why, you might wonder, get Family Guy into this? Well, there is the obvious relation with both Brian the dog’s and the two men’s “ridiculously high” expectations of their women (and in both cases, the men looks stupid in being full of themselves). But more importantly, there is this: the opinion that art should present people and life more realistically. It should not glorify people but show their weaknesses, and we should accept it and learn from it. 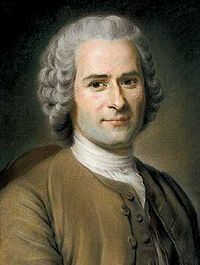 Jean-Jacques Rousseau was the most important philosopher and writer representing this trend during the times of Mozart. He thought that the Arts, in its polished but substanceless manners and glorification of heroes, maintained the status-quo of society instead of pushing it towards more equality and freedom. “For a long time the society of man has offered only false appearance without reality, without truth” writes Rosseau. He thought the arts should start “to distinguish reality from appearance and the man of nature from the fictitious and fantastic man who is the fruit of our institutions and prejudices”. If you think of it, this discussion is still relevant. To some of us, Family Guy is not only a show with silly jokes, it’s a refreshing show with a dysfunctional family which is more realistic than many Hollywood movies where everyone is pretty, everyone has money without working a lot and nobody seem to go to the bathroom (except in Dumb and Dumber). Mozart’s letters are full of making fun of powerful people, and his operas have “real” people rather than heroes. Family Guy is the modern version of this thinking. Family Guy is poking fun of “Family values”, the perception of a perfect family, all happy and sane. Well, they ARE happy. With all their imperfections. So, back to Beethoven: while Mozart is quite Family Guy, Beethoven is not so much. Beethoven brings back the heroic, emotionally somewhat utopian style (which is the reason that the Nazi’s, sadly, used Beethoven’s ninth as propaganda music; they could never do that with Mozart’s music). And now, back to the Tempest sonata! This is how basically what would come before every recitative. 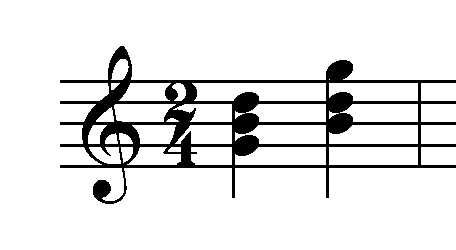 It is a chord played as an arpeggio in first inversion, meaning that its lowest note, the bass-note, is not the main note, but the third note in that key’s scale. So, if it’s G major like in this picture, then the first chord with G as bass is called root position, the second chord is called…first inversion. The new tonality is quite far away from the original one, so Beethoven keep surprising us, the mystery keeps going. Of course, the haunting theme comes back, but now it doesn’t stop. There is something theatrical in this music, no? I really think so, and that might be why the Shakespearian name has stuck. Then comes this glittery passage to close the exposition, I love this part: it has no real melody, but it is very beautiful nevertheless. It’s actually a canon. as we know by now, after the development comes the recapitulation and it starts exactly like the exposition, as normally should be. This is a quite amazing moment, not only for its originality. There is a clear rhetoric spirit, but…there is also such melodic beauty in this part. And remember, a recitative is not supposed to be too melodic, because if you can sing it as an aria, why make a recitative? However, Beethoven has no lyrics to worry about and as the creative genius he is, he turns this recitative to the most melodic, the most expressively human and the most painful (I think) part of the whole first movement. This is a wonderful way of taking us through and explaining one of Beethoven’s fantastic pieces. Thank you! When I was younger, I could really be hurt by those besserwissers. Today I’ve learned to handle this better. I’m sure I sometimes also look like a besserwisser in the eyes of some other people, but so be it. Respect is always important: respect for someone else’s skills AS WELL as respect for pure love. Even if there always be someone who loves better and knows more. I am making no secret of my opinion that Per is the best Beethoven interpreter of today. Perhaps someone else soon will show up and say “Oh no! What about Rigor Ridicurotta then, huh? HUH?” (And I say “Rigor Who?” and then I’m the ignorant fool again, and so on.) But my opinion is not based on the fact that I am the most skilled pianist connoisseur in the world, but because I feel like home when I hear his performances. Like I was playing myself, although I cannot. OK, so The Tempest was new to me, but I was enchanted by the performance here in the video clip. So enchanted that I started to cry. Partly it was because of the technical skill I witnessed here, but also – I think – because of something very intriguing in the music itself. I’ve got the feeling that there is “something more” hidden in the music and I think you made a fantastic explanation here, Per, which to some extent clarified why I felt like that. Great job with this posting. Tack för intensiv och lärorik Storm-intro! Hörde Dina konserter i Helsingborg och tänkte ut en lämplig filmtitel: “Solomon: The Return!” (ungefär som Batman). Gick sen hem och lyssnade på hans HMV-inspelningar från femtiotalet (som jag inte alls vet om Du hört) – men klarheten och känsligheten förenar (för mig) era tolkningar! Hur som helst frågade Du då: varför heter sonaten 81 just 81a? Såg då i en bok av Bernhard Paumgarner: Das kleine Beethovenbuch från 1968, Residenz Verlag Salzburg att Lebewohl/Les Adieux sannolikt fick två olika utgåvor, en med tysk titel, en med fransk. B. blev nämligen så förbannad på förläggarens franska titelförslag (läs: pissed off på Napoleon) och ville ha Lebe wohl (Farväl) som är något helt annat än det slafsiga franska Adieux! och som enl B. kan framsägas till “en hel församling, ja hela städer, men Lebe wohl säger man hjärtligt till en enskild person”. Ja det var fina stunder i Helsingborg, vi ses där i höst! SO nice that you have the time to write again, I really missed your Beethoven stories 🙂 Not sure if you’ve told this, but why did you take on this mammoth job with the sonatas in the 1st place? I agree with Anu ! Great respect for taking on the ’32’ ! I am in the process of working on the ‘Tempest’ I adore your explanations, I have to admit I have never watched ‘family guy’ and probably never will, but how ingenious using this to explain the personalities. I am sure many people will be able to relate to this analogy. I especially love playing the second movement of this sonata. I am now working on the third, which I love. I too tried to read Shakespeare’s Tempest to find a connection, and perhaps it is this line you found, as this was written shortly after the Heiligenstadt Testament.